For a Mexican fiesta-themed cookout we went to yesterday, I made pink lemonade cupcakes. I thought something cool & sweet would pair nicely with Mexican's hot & spicy flavors! 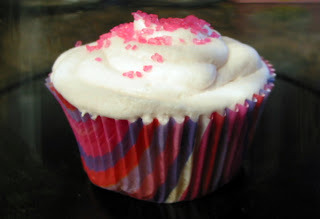 I found several recipes for these cupcakes online, and tweaked those to use what I had on hand. They are sweet but tart, and provide a great contrast to a spicy meal! Combine all ingredients in mixer bowl, mix on low until well blended, then mix on medium for about another minute. Fill each liner about 2/3 full, bake 25 minutes. Combine all ingredients in mixer bowl except for lemonade concentrate. Mix on low until ingredients are combined, add lemonade concentrate a TBSP at a time. Continue mixing on medium-high until it is the consistency you are looking for. Spoon into bag (with decorator tip of your choice), frost cupcakes. Looks cute if you sprinkle the buttercream with pink or yellow sugar. Sounds delicious! Thanks for posting the recipe! Also thanks for the blog visit- I am now following you! Hey! I'm having a linky party called A Themed Baker's Sunday where this weeks theme is LEMONS! I'd love for you to link this recipe on my blog! See you there! Great job on the linky party last week! It was very hard to choose from everyone. Come by again and link up to this week's theme: Chocolate! Hope to see you there.